Alain Ducasse sits at the Table Lumiere in his new London restaurant at the Dorchester hotel. Inside this gourmet grotto, a curtain of fibre optic lights shimmer in a circle around him, while a glass vasselier at his side groans with a booty of Saint-Louis crystal goblets, delectable Hermès china and Puiforcat silver. Later these precious items will be laid on this table, a private space for six where dishes such as Ducasse’s chestnut veloute with foie gras and whipped cream; oeufs mollet wrapped in silver leaf; and roasted pigeon with Tuscan crostini will be served. At the moment, there is nothing on the bare linen tablecloth in front of Monsieur Ducasse except a small cup of espresso and a copy of a restaurant review. This is a difficult moment for me. For it is my review of his newly opened London restaurant he is reading and it was not, shall we say, an entirely positive one. From across the table I can see that some of my sentences have been highlighted with yellow fluorescent pen and inky annotations have been made in the margins. For a restaurant critic, this is like having your homework checked by God. Ducasse taps his finger on the table and begins. That was the problem, I say. It wasn’t firm. It had no texture. It was too soft. ‘Perhaps it was overcooked,’ he says. Well, that could suggest that there was something wrong with it. But no, it wasn’t overcooked, it had a translucent point in the centre. Yet it had the wrong texture - it was too soft - and there was not much flavour, which led me to suspect it was cheap, farmed fish. Not the superior, wild variety you would expect on a menu charging £75 for three courses. And not that one would expect to see a little slice of dear old halibut in there at all; a country mouse out of place, perhaps, amid the soufflé bouche glasses, the porcelain sculptures and the waitresses clad in outfits designed by Amanda Wakeley. But Alain Ducasse is having none of it. Then the dextrous business skills which have seen him build a culinary empire with 15 Michelin stars - a girdle of 27 restaurants strung across the globe from Rio to Singapore and beyond – finds a safer footing in the frosty confines of the Table Lumiere. One more critic moaning about her fish dish; what does it matter to him? ‘You must come again. I promise you that next time it will be better,’ he says, with a smile. 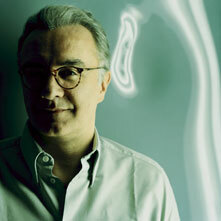 At the age of 51, Alain Ducasse is one of the most famous chefs in the world. He is the man Gordon Ramsay aspires to be, the only serious rival to the likes of Joel Robuchon and Pierre Gagnaire. Born on a farm in south west France, he developed an early appreciation for local specialities such as mushrooms and foie gras and began cooking in professional kitchens when he was 16. He was meticulous, dedicated, quietly focused. After apprenticeships with great chefs such as Michel Guerard, Gaston Lenotre, and Roger Verge, his first notable success was at the Hotel de Paris in Monaco, where he won three Michelin stars for his cooking when he was 33. Yet this was not enough for Ducasse, who has always regarded expansion as the key to success. He still does. In an article published in the Independent on Sunday recently, Ducasse was incredulous that the UK’s Heston Blumenthal, the chef-proprietor of the Fat Duck in Bray, seemed content to open only a measly two more restaurants. Meanwhile, Le Louis XV – Alain Ducasse in Monaco, still forms the bedrock of his business. ‘It is the most luxurious restaurant in the world,’ he says, and it is certainly good enough for Gordon Ramsay, who took his wife there on their first date. Meanwhile, Ducasse’s restaurant at the Plaza Athenee hotel in Paris is known as one of the best in the city, while Beige-Alain Ducasse in Tokyo form the other twin peaks in his range of signature, luxury restaurants. They are the kind of places which are knee deep in truffles and caviar, where lavish main courses weigh in at around 100 euros each. Those expecting his new 80-seat London restaurant to hit the same heights of opulence have been disappointed. Ducasse has perfected the role of the modern executive chef, providing a template for an international fine dining kingdom operated by remote control and a crack team of chefs. Sometimes, however, I wonder if the effect this has on the restaurant trade in general and restaurant-going public in particular is an entirely positive one. For example, Ducasse sees no problem with international cultural homogenisation and in spite of current fashionable paeans to seasonality, he has raspberries on his London menu. In November. Does this not conflict with current fashionable tendencies and your desire to serve seasonal food? ‘Non.’ Then a little shrug. Ducasse married his long term girlfriend Gwenaelle Gueguen at the Hotel du Palais in Biarritz earlier this month. He says that she has changed him and ‘made me a better person.’ They married on St Gwenaelle’s Day, in the hotel where he first worked as a young chef 30 years ago, which suggests that underneath his Lebanese jacket and sly, jester smile, he has much more of a romantic soul than one initially suspects. The wedding feast consisted of scallops, then roast turbot, then capon, all washed down with white burgundy and a jolly decent bordeaux. ‘It was a nice meal, very classic,’ says Ducasse.